Discover a standout recipe for your next cookout with these tangy Herb Grilled Kabobs. 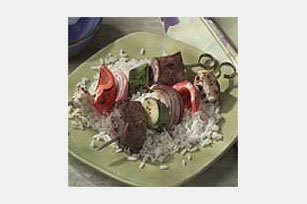 Sirloin steak and fresh vegetables are brushed with MIRACLE WHIP and vinaigrette in our Herb Grilled Kabobs recipe. Preheat grill to medium-high heat. Alternately arrange meat and vegetables on skewers. Mix dressings. Place kabobs on grill; brush with the dressing mixture. Grill 10 to 15 min. or until steak is cooked through, turning over after 8 min. Serve with the rice. Assemble kabobs as directed; place on rack of broiler pan. Brush with the dressing mixture. Broil, 5 to 7 inches from heat, 10 to 15 min. or until steak is cooked through, turning over after 8 min. Prepare as directed, substituting boneless skinless chicken breasts for the steak and/or using MIRACLE WHIP Light Dressing. The key to making great kabobs is to cut the meat and/or vegetables into equal-size pieces. Then, thread the pieces onto metal or soaked wooden skewers as desired. When grilling, rotate the kabobs frequently with long-handled grilling tongs to ensure even cooking on all sides.